I know you recognized the dress that Anne Curtis wore at the Bench fashion show! I supposed it was the same dress that Ria Bolivar wore on the runway for the Spring / Summer 2013 Collection of Ezra Santos. 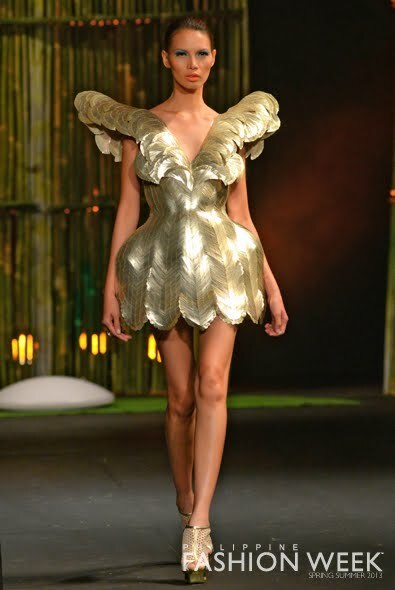 Like I said, this dress reminds me of Lady Gaga because it looks like an armor dress too. I am not sure but it seems to be made out of capiz or mother of pearl shell. mas malakas ang dating nung si ann ang nagdala =) love it! The dress looked 10x more expensive with Ria Bolivar. I think Ria Bolivar definitely wore the dress better than Anne Curtis.